Summary: If you’re a fan, this third instalment in the Desperado trilogy is the least satisfying, but it’s still bloody fun and bloodily exciting. Robert Rodriguez is a talented man. As Once Upon A Time in Mexico’s opening credits relate, he wrote, directed, “shot, chopped and scored” this movie. A legend of budget filmmaking, he has attracted a stellar cast: Antonio Banderas, Johnny Depp, Salma Hayek, Willem Dafoe, Mickey Rourke, Eva Mendes … even Enrique Iglesias alongside perennial Rodriguez favourites Cheech Marin and Danny Trejo. But as the title suggests, does it deserve consideration alongside the masterpieces of Sergio Leone? Well, no. That’s not to say this isn’t a hugely enjoyable movie. Though arguably less impressive than Desperado, the action sequences are still expertly set-up and ingenious (Banderas and Hayek fleeing gunfire down a building while handcuffed together; Banderas surfing his guitar case downstairs, guns blazing). And like any good film these days, it benefits from the presence of Johnny Depp camping it up. After Pirates of the Caribbean, this similarly tongue-in-cheek role hardly stretches him, but his amoral agent provocateur Sands is hilarious. From a fake third arm to his slogan T-shirts, pithy putdowns (“Are you a Mexican or a Mexican’t?”) to a sweetly trusting relationship with a Mexican boy, Sands is a Machiavellian smartarse who, unfortunately for him, isn’t quite as smart as he thinks. Unfortunately for us though, Depp is a big part of what’s wrong with this film. Once Upon A Time’s main narrative thread is Sands’ attempt to spark a military coup in Mexico, a big theme that with the Mexican population’s resistance argues for epic consideration. As should Banderas’ hero El Mariachi, a mythical figure (“The tallest man in Mexico,” Marin tells a smirking Depp) bent on revenge for the murder of Carolina (Hayek) and their daughter. But Rodriguez can’t seem to decide which thread to give more prominence, and both come across as barely connected to each other. Most curious of all, the El Mariachi who was so striking in Desperado has surprisingly few lines here and seems an infinitely smaller presence than Sands, an incongruity mirrored in the villains: The almost hallucinatory General Marquez (Gerardo Virgil) exists mostly in recollection, and his fleeting appearances bode well for the final showdown. So where’s the need for Dafoe’s drug lord Barillo and his plastic surgery antics, a fact tacitly admitted by a script which gives greater prominence to his chihuahua-stroking henchman (Mickey Bourke). Perhaps Rodriguez, surpassing himself for so long with meagre resources is overwhelmed by the riches at his disposal here. There are, quite simply, too many main characters. With El seeking Marquez, his family’s murderer, Barillo is pursued by a retired FBI agent (Rubén Blades). But even if the film chose to focus on the tangled web woven by Sands, Mendes’ rogue police officer and El’s guitarist comrades (Iglesias and Marco Leonardi) would still seem superfluous. And if you want to be cruel, superfluous eye-candy. So forget the plot. 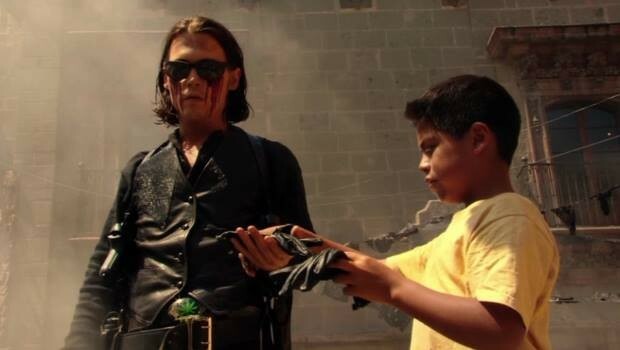 The spontaneous uprising of the Mexicans could have been gripping, but Rodriguez can’t keep the script tight enough. Blades is good in his supporting role and Depp’s Sands surely merits a film on his own. But the real stars are the guns and explosions. If you’re a fan, this third instalment in the Desperado trilogy is the least satisfying, but it’s still bloody fun and bloodily exciting.